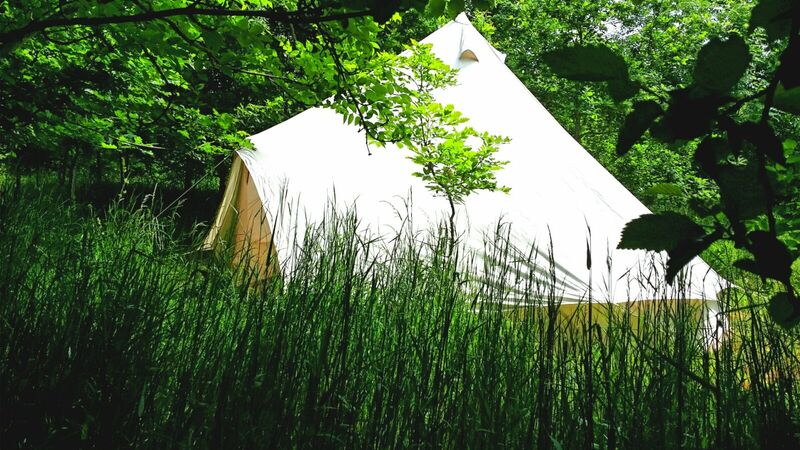 Luxury off=grid glamping holidays set among the trees in the heart of rural Somerset. or call 01225 29 09 24. 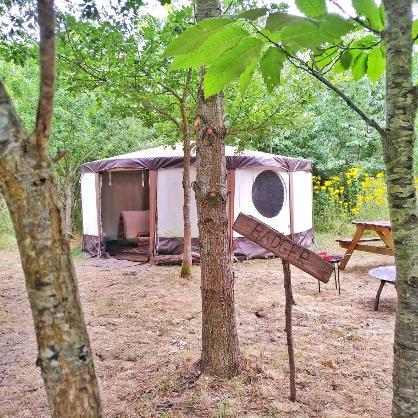 Woodland Escape specialises in off-grid eco glamping holidays set in our wood in Somerset. 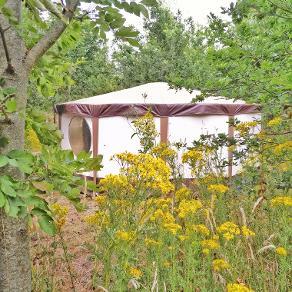 There are currently three types of accommodation set in the wood including Bell tents, our Canvas Lodge and Stargazer Yurts. 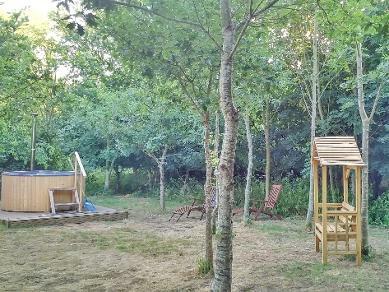 Woodland Escape is the combination of the experience gleaned from over a decade in UK glamping holidays and more than half a century in providing family breaks across the West Country. We have taken the best bits of luxury camping and gone off-grid. Our accommodation is situated on our wood in rural Somerset with easy road and local rail connections. 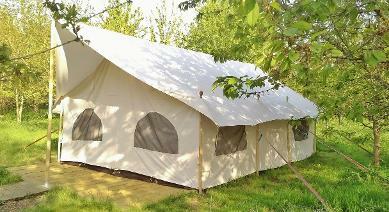 Deluxe Glamping - Extra Luxury! 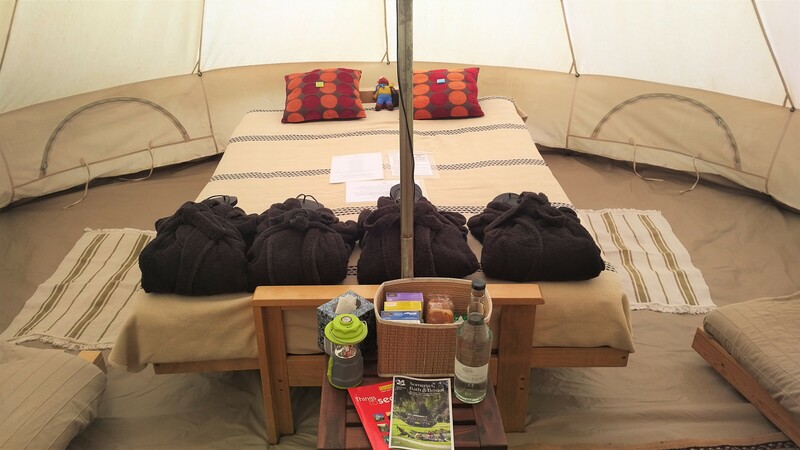 Our new glamping Deluxe packages come inclusive of all bedding, a towel set for each guest plus logs, kindling, charcoal, firelighters and even a packet of marshmallows to roast. Our wood-fired hot tub is nestled in a quiet corner of the site. Have a great relaxtion break or romantic holiday with our wood-burning hot tub for private use. We make hire easy for you and also provide towels, gowns & flip flops for every guest glamping with hot tub hire. Looking ahead to summer? Book now and save! Woodland Escape provides luxury eco glamping to bring you close to nature. 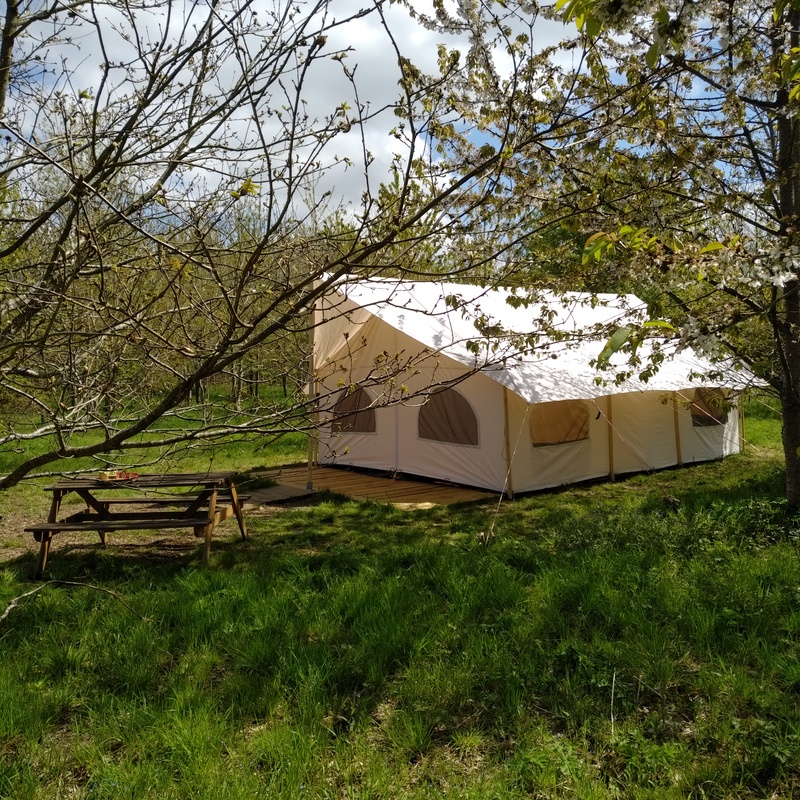 Our Bell tents, Yurts & Canvas Lodge are all nestled in the natural clearings between the trees of our wood providing an ideal countryside escape for your break and our Yurts have a see-through central roof dome to allow natural light in during the day and stargazing at night. Woodland Escape is part of a new breed of glampsites. We have utilised over half a century's experience that our family has in providing holiday accommodation and combined this with a decade in glamping holidays to design an ideal off-grid experience for our guests. We have not just used our experience - Woodland Escape has been created based on the feedback from our guests here and at our family's other sites, therefore we aim to provide what our guests have told us they want; a high quality getaway, in a rural location with good facilities, which cares for our environment and a high level of service. At Woodland Escape we welcome guests for a range of getaways here in Somerset and we look forward to sharing our rustic woodland experience with you whether you are joining us for a couple's romantic glamping getaway, family break glamping with the kids, birthday celebration, inter-generational holiday, or a mixed group for a digital detox retreat. With each accommodation nestled within natural clearings among the wood, Woodland Escape is our best glamping site for secluded breaks. 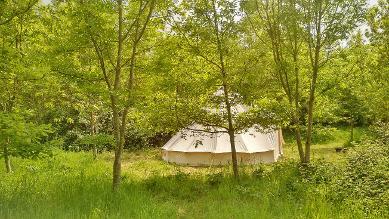 Woodland Escape is also ideal as a yoga retreat. More studies are showing that living trees are immensely beneficial to our health, proving that forest bathing and shinrin-yoku are worthwhile practices towards maintaining wellness and combating afflictions present in our society. We are also firm believers in unplugging from electronic devices for better peace of mind, and whilst we are not on patrol ensuring everyone is digitally detoxing, to get the most out of your experience we recommend leaving all of the distractions of modern life behind before you set off. 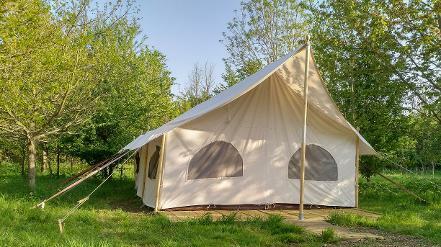 Our original family-run glampsite is one of the most established available. Having provided holidays in a variety of different accommodation there since 2006 we have an enviable level of experience in the industry and with almost all types of accommodation, this allows us to pick the most suitable options for your break at Woodland Escape. 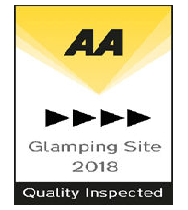 Our MD is the grandson of our sister holiday park's original founders, and whilst many things have changed since the 'heyday' of traditional camping, the original founders are still involved in the holiday park to this day ensuring our standards are always as high as possible and that you receive a friendly family welcome upon your arrival. This high level of traditional, individual service - which was the keystone of our original site - is the foundation on which we have built Woodland Escape. 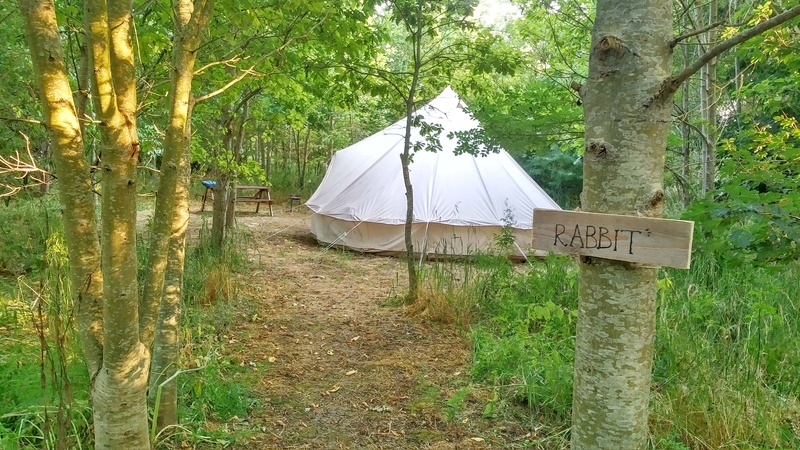 Stag, Hen & party glamping groups are also welcome at Woodland Escape with exclusive hire of the site to have their freedom to enjoy their own private glamping experience. We have sourced renewable energy options to maintain the glampsite's low carbon footprint whilst maintaining high levels of comfort for you during your getaway. Each accommodation has its own solar power source providing plenty of light inside as well as a means of charging your phone if required, though we encourage our guests to fully undergo a digital detox during their stay with us. Feel free to borrow a book or some games from the office tent! 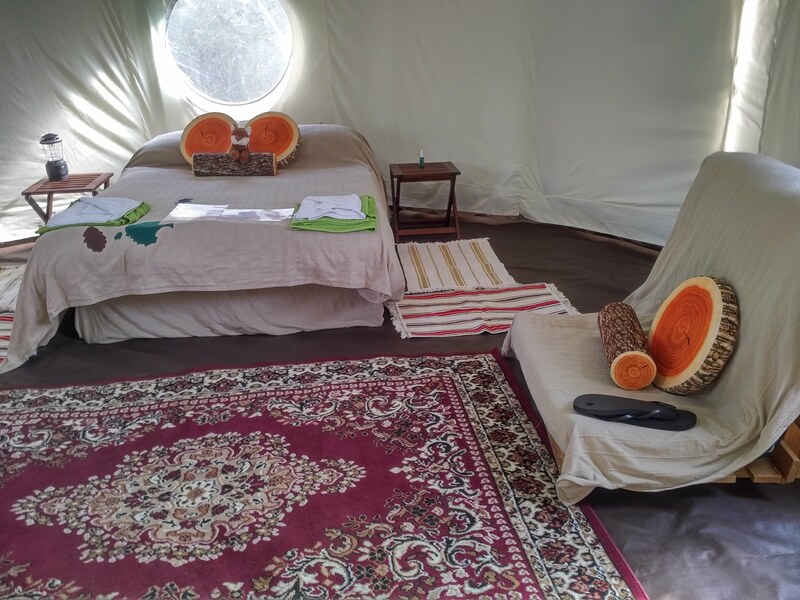 Whilst we are firm believers in eco glamping, sustainable, environmentally-friendly holidays & renewable energy; we also know that our guests want a comfortable experience. For this reason we have specially chosen luxury transportable shower and toilet facilities for our glampsite in the wood. Our centrally located shower blocks and flushing toilets are all designed to provide our guests with the comforts you would expect, even though the site is a rural escape to the woods off the municipal gas & electricity systems. Today's BBC weather outlook for Tuesday 23 April 2019 here in Somerset forecasts clear.